Your advice, please. I'd like to make hamburger rolls from my bread doughs. How do you figure out how long to bake - to accommodate for the smaller sizes? 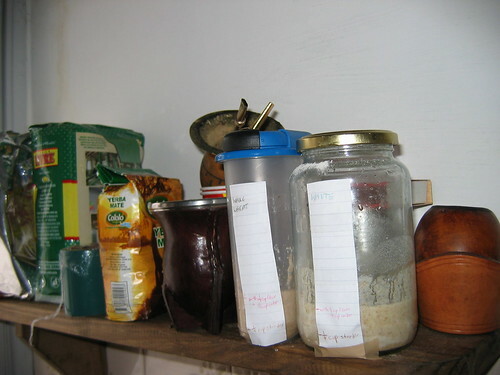 Read more about Making rolls? 1. Adding vital wheat gluten. Last time I made this formula, it was dense and gummy. I'm hoping the VWG improves the texture. 2. Overnight ferment. I kneaded the dough, let it proof at room temp about an hour, then put it in the fridge overnight. In the morning, I put it in a warm spot for 2 hours until it had almost doubled from its original size. 3. Used a heating pad under the couche. Since I seem to always get a lackluster final rise (and the dough was still a bit cool from its overnight fridging), I decided to try the heating pad. It seems to have worked, as I got a nice rise out of the loaves, but it didn't happen overly fast. It took almost 2 hours for the loaves to almost double. 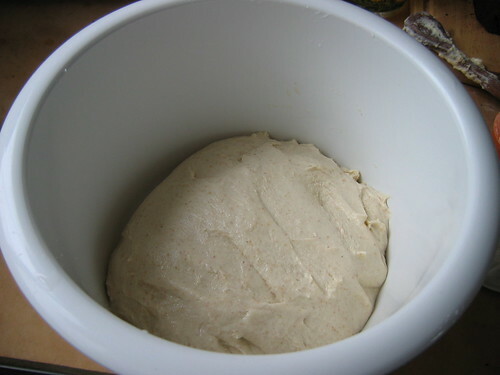 I made a simple dough this morning with the intent of making some type of a picnic bread today. Something with cheese and onion, perhaps olives or sausage mixed in. But then we ended up picnicing at the lake today as well. After a long day in the sun, I just couldn't face the prospect of baking in 90 degree weather. Actually, it wasn't the baking as much as having the house heat up, particularly the upstairs bedroom, which get sweltering on hot days. So I froze the dough for a later date. 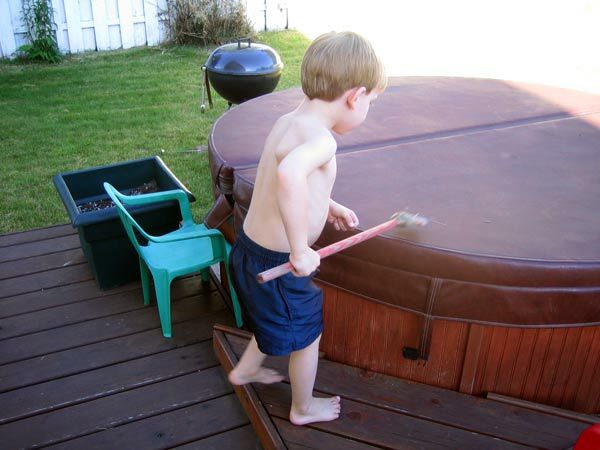 His toy broom, which has hardly a bristle left, has recently been transformed into a peel. A super peel, perhaps? 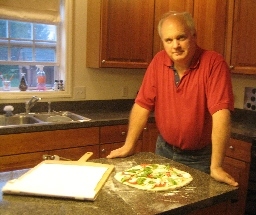 He spent a good half hour loading and unloading loaves in the oven (hot tub lid) while we made dinner. 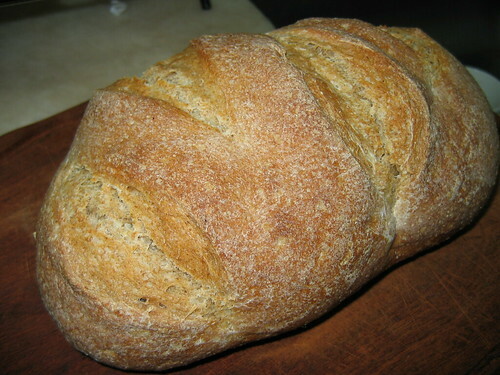 Thanks to this site, I baked my very first sourdough loaf today after two weeks of preparation :) Yippeeee!!! 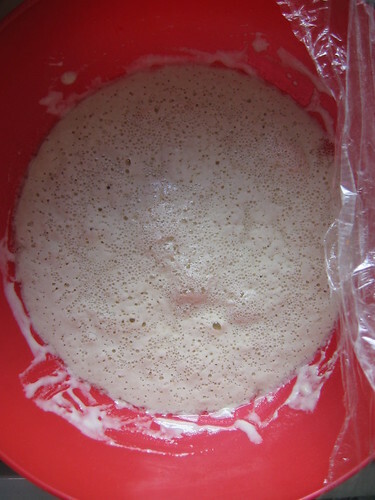 Here is a pictoral account of my adventure...Day 1 is the day I began making my homemade starter. 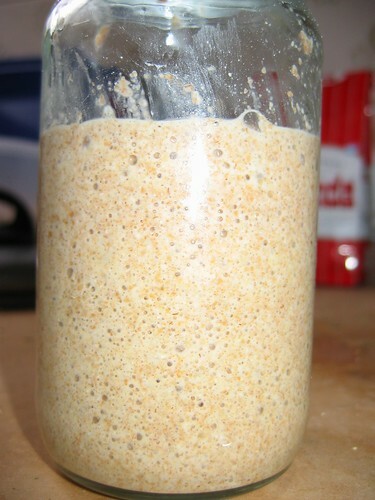 Day 5...my first big day of "bubble action" in my homemade starter!!! I think I added 1 cup of flour and 1 cup of water to 1/2 cup of active room-temperature starter the night before, but I have no idea if this is the correct method??? After approximately 5 hours at a cool room temperature, there was definite evidence of "yeasty action"!!! I like to call these wet masses of dough my pre-shaping "globs"
Both shaped loaves went into the fridge overnight. 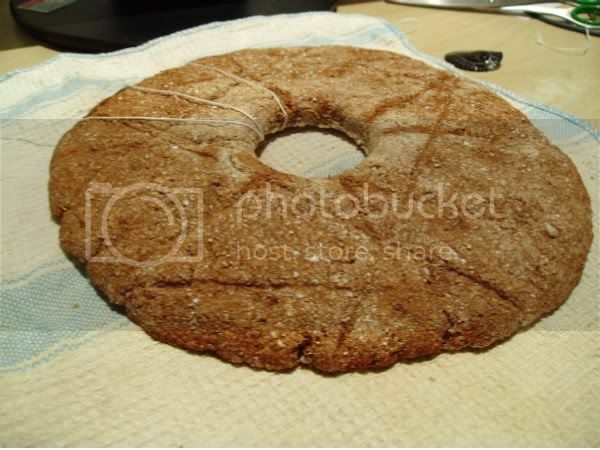 In the morning, the oval loaf was significantly flatter, and there were chunks of ice on the baking mat!!! Yikes!!! Whoops! Maybe I let it rise for too long? 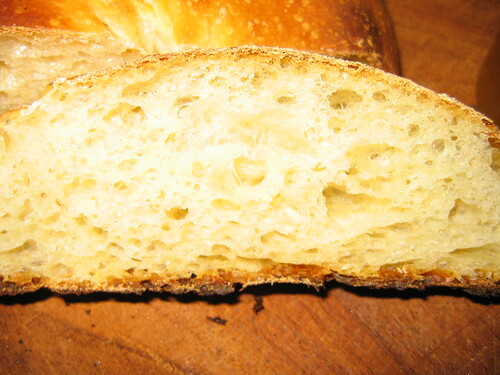 Oh well....I thought the final product was yummy (slightly sour taste) and I loved the texture of the crumb. Final product--My First Sourdough Loaf!!! I had a lot of fun shaping this crust (like he suggestd, just turned it around and around, stretching the dough into an approximate circle), and it turned out well. 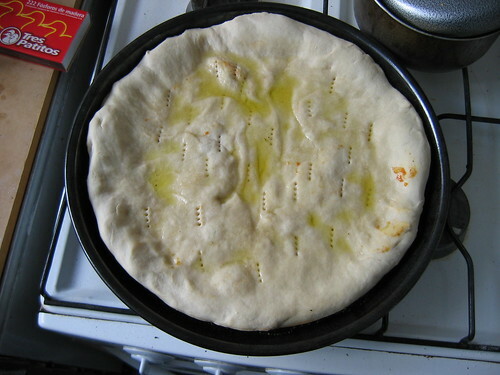 My husband likes to prebake the crust with olive oil, then bake it for a short time with toppings...works well for me too! 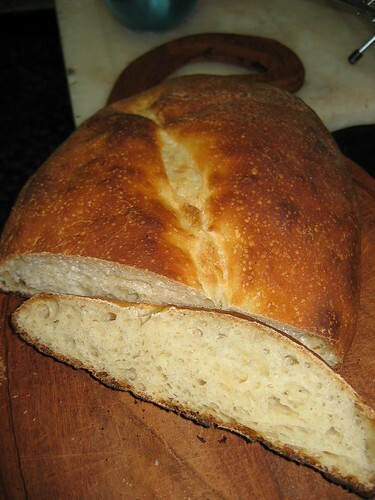 Read more about My First Sourdough Adventure! ~3 days before, I started 1/4 cup raisins soaking in enough rum to cover them (3 Tbsp?). I thought I was going to make the pudding that night, but I didn't have time and boy were the raising yummy when I finally got around to using them!!! 8 cups stale/oven-dried bread cubes (very approximate amount...I used a mixture of chocolate coffee bread and daily bread). 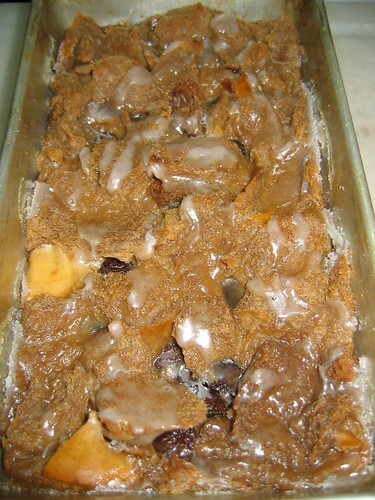 *I don't have many baking pans, so I simply divided the bread cubes and put them into 2 well-greased loaf pans, sprinkling the raisins and rum (Step 1) throughout the layers. 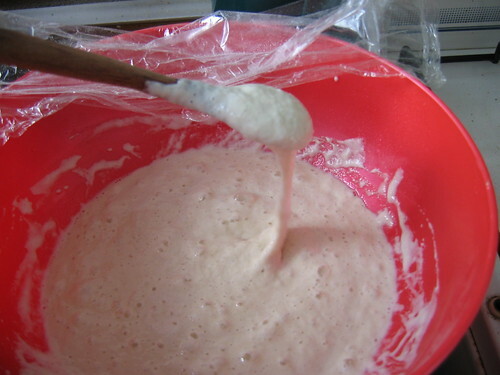 *Pour warm liquid mixture from Step 4 over the bread mixture and press the bread down so it is well-soaked. I don't have control over my oven temperature, but I baked them at a "moderate" temperature for about 1 hour (until a toothpick in the center came out clean. I made a quick glaze out of icing sugar, rum and lemon juice and distributed it over the top of the warm puddings. They can't get over how long is stays fresh-tasting for, and even the kids love it! Thanks Floydm!!! I started this as a new thread, under a more appropriate title, in the hopes that it may generate more information for you. Surely, I wish everyone would buy this product. Sales have been good and feedback always positive, but alas it will never be for everyone. I know that others just use a lot more flour for handling, or use a sheet of parchment paper underneath to transfer. 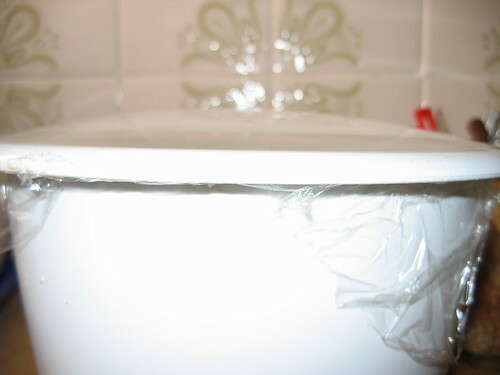 Neither of these may be perfect solutions for everyone, and the Super Peel can make the transfer process a whole lot easier and more predictable. Can anyone explain how to get consistent double-spacing of paragraphs in all areas of the site (blogs, forums, comments)? The P tag doesn't work and I can't get comments, for example, to double-space at all. Whereas brand-new forum entries DO double-space. My attempt at 100% Rye Finnish sourdough bread. Well, since i lack a pole, that also explains the string tied around it. It's hanging in my closet alongside a slab of beef (dun ask why :P), drying and waiting to be tasted in a few days time. I can't imagine what my loaves would be without the wonderful special bread spices. Oh poppycock, yes I do, they would be bland and almost boring. You see I bake low salt. Now if I want to cut back on the salt something has to add some flavour. I started out putting in bread spices (the flavour) not because of the lack of salt but just because I like it. Reducing the salt was easy. When my local baker found out I would be going off to a foreign land, and would probably be baking, (Why bother in Austria where the bread, cheese and wine are so good!) he would give me a good 1/4 kilo portion of his special brotgewürz. On one condition, that I don't bring any of it back with me and go into competition with him. Fair enough. 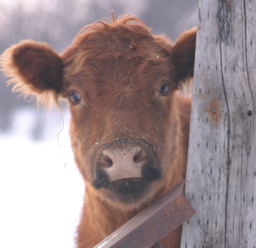 Rye is my favorite grain, followed by oats and corn. Now when I first started out with rye, something always seemed to be missing. I threw in all kinds of combinations and included molasses. Molasses was a key. Eliminate the sugar and add molasses. Caraway rye, well who never heard of caraway and rye? 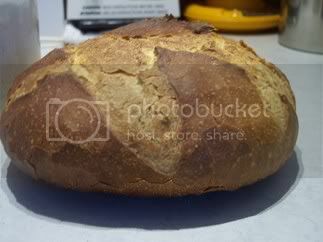 Now the rye needed some glue and white bread flour fit the bill, a handful or two, and sometimes powdered milk, sometimes a spoon or two of oil. The secret was the spices and plenty of it. Well, my baker died, God bless his soul, and with him his secret. Before I came here to China, I also knew I'd be baking so off I went to my Austrian Supermarket in search of spice.... and low and behold! They now sell Brotgewürz and in the handy 320gm plastic vacuum sealed jar! Perfect for traveling. You may laugh about this or you may cry but I'm just happy. It isn't quite the same, but it's very good. 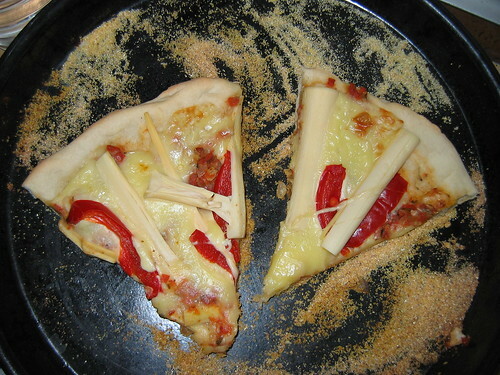 Now what are those ingredients? Well a combination of Fennel, Coriander and Caraway seeds, crushed. Packaged by Kotanyi GmbH In what proportions it doesn't say but it wouldn't take too long to figure it out. I personally add more caraway and it is a very hard seed to crush. I even like it in white bread or sprinkled on top of rolls. 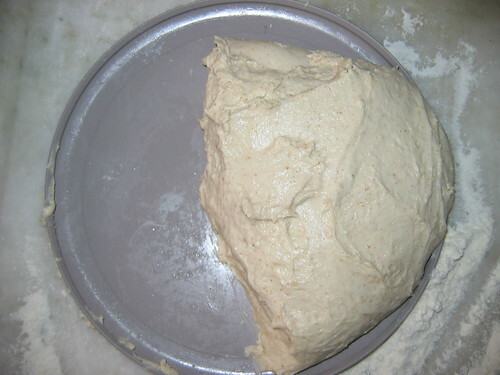 Mix all ingredients into a dough and knead till smooth and elastic. Let rest 30 minutes. 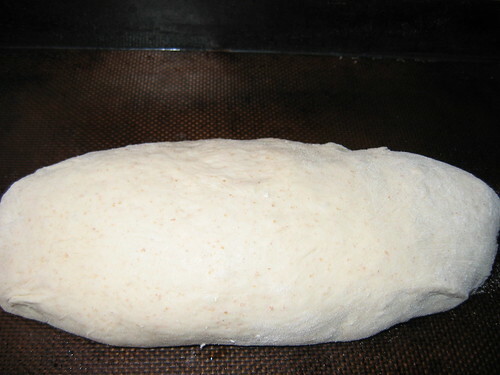 Put into the desired shape and form and eventually bake in preheated oven 200°c for 65 minutes. I haven't tried this recipe but it seems in order. I would reduce the salt to less than 10 gm. (one teaspoon=5 gm) If you choose to use only sourdough and no commercial yeast, I suggest letting it rise in floured form for 20 min before putting into the oven. As you can see, there is no sugar, A flat tablespoon of honey or molasses might help the sourdough rise. If your sourdough is as soupy as mine, use two cups of it and reduce the water above to about 200ml or 300ml. 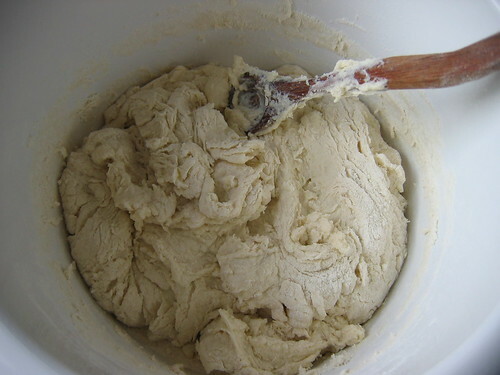 The dough looks like a wet one. The kind I like to beat in the bowl with a sturdy spoon.